Several months after it was revealed that Germany was able to only recover a miserable 5 tons of its gold in all of 2013 (under 10% of the 84 tons it was scheduled to repatriate), Germany appears to have given up entirely in its attempt to recover gold which simply is not there, and as Michael Krieger reports, citing Bloomberg, has decided to keep “it” (by “it” we don’t mean the gold since that clearly has not been at the Fed for decades, but merely the paper promises of ownership: for more see China’s gold rehypothecation scandal and how the unwind works) at the NY Fed after all. That is to say, in the “safe hands” of former Goldmanite Bill Dudley. Just last week, I published a post titled, Video of the Day – “End the Fed” Rallies are Exploding Throughout Germany, which subsequently went viral. Interestingly, only a few days later we find out that Germany’s very own criminal political class has decided it will continue to store the nation’s gold in New York rather than bring it back home as had been the intention. It’s quite ironic that just as protests against the fascist Federal Reserve are spreading throughout the land, the political class officially decides to keep Germany’s treasure across the Atlantic, in care of none other than The Fed itself. To be fair, this merely seems like a way for Angela Merkel and the rest of her German cronies to save face. After all, it was very clear that the Federal Reserve had already told them “no” when they asked for the gold back in the first place. Why else would it take almost a decade to transport the gold from the U.S. to Germany, which was the latest repatriation schedule. Ending talk of repatriating the world’s second-biggest gold reserves removes a potential irritant in U.S.-German relations. It’s also a rebuff to critics including the anti-euro Alternative for Germany party, which says all the gold should return to Frankfurt so it can’t be impounded to blackmail Germany into keeping the currency union together. 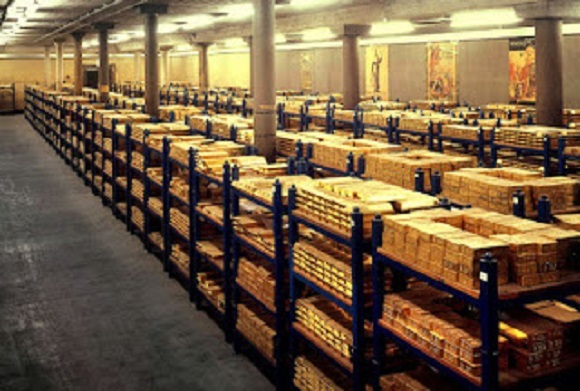 The Bundesbank, Germany’s central bank, sent a delegation to the New York Fed’s vault in 2012 for spot checks on the hoard. As the gold’s guardian, the Frankfurt-based Bundesbank is obliged to ensure its safety. It says it’s sensible to store part of the reserves outside the country so they can be swapped more easily for foreign currency in an emergency. German gold reserves, the second-biggest in the world after those of the U.S., totaled 3,386.4 tons on March 31, according to World Gold Council data. Due to German postwar history, the biggest part is stored at the Federal Reserve Bank of New York; the rest is in London, Paris and Frankfurt. “Right now, our campaign is on hold,” Peter Boehringer, a Munich-based euro critic who co-founded an initiative to bring home all of Germany’s gold in 2012, said in an interview. You cannot “repatriate” what does not exist. MORE on German Gold: As your supply of gold is gradually replenished, you should gradually begin paying debts with the commercial paper you were given in exchange for the gold, especially debts in the U.S. WHEN the due date arrives, and Germany presents its commercial paper to receive the gold, Germany will be told that its commercial paper is false, and the gold will never be returned. To resolve this fraud in the meantime, Germany should be replenishing its own supply of Gold.